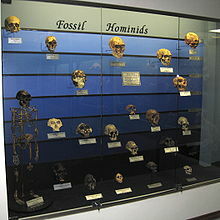 Paleoanthropology (or palaeoanthropology) combines the study of paleontology and physical anthropology. It is the study of human evolution. The subject is also closely connected to archaeology. The evidence of tool-making and other activities shows the subtle but important changes in thinking that early humans went through. ↑ "Introduction to human evolution". National Museum of Natural History. Smithsonian Institution. Retrieved 17 August 2016. ↑ Barry Lewis; Robert Jurmain & Lynn Kilgore 2013. Understanding humans: an introduction to physical anthropology and archaeology. 11th ed, Belmont CA: Wadsworth Cengage Learning, p. 18. ↑ "Dexterity and early tools". PBS: Evolution. WGBH Educational Foundation; Clear Blue Sky Productions, Inc. Retrieved 17 August 2016. This page was last changed on 31 August 2017, at 09:26.